Don't panic, the Glassholes aren't returning. We think. 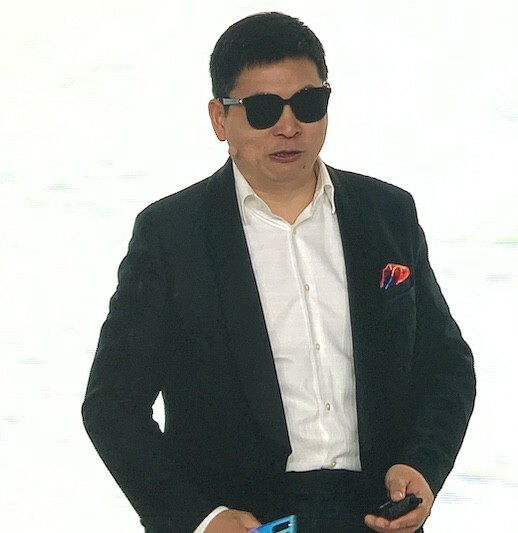 On Monday, in a long and rambling presentation which overran by an hour – Huawei's Richard Yu unveiled its first "Smart Glasses" to an audience of over 3,000. But they aren't what you think. The collaboration with Korean fashion specs brand Gentle Monster doesn't attempt to embed an augmented reality headset and computer in a spectacles frame, as Google did. It's much more modest, essentially embedding earphones and mic into a spectacles frame. In other words, they're spectacle-hearing-aids or music-glasses – which have been on the market for a very long time. These Smart Glasses aren't smart – or really even pretending to be. They're large and not particularly fashionable, unless your style is "Gangnam Style" – although we found one gadget blog that disagrees. You may wonder what the fuss is about. Or more accurately why there isn't much fuss. Smart Glasses That Aren't Actually Smart do represent a longing to create a new consumer electronics market which hasn't seen a hit since the Amazon Echo. All those production lines for chips and other components are going exactly where they went years ago. That isn't good for business. Why not Huawei? It's been selling personal electronics earpieces and fitness bands, even combining the two, since Mobile World Congress in 2014. There is plenty of applied R&D in its wearable gear and smartphones with potential to take today's products and make them much neater. Or at least smaller. However, the observations by Hankook Kim, Gentle Monster's CEO, are fairly spot on. If he's correct, the Glassholes will never come back. Kim pointed out – with an expression registering 11 on the disbelief scale – how intrusive it was to insert a camera into the private physical space enjoyed by "friends and lovers". Did Sergey Brin never think of this? Kim seemed equally disparaging of people taking their phones out of their pockets to check notifications – another intrusion into everyday physical interaction. A decade ago it was standard social etiquette (at least in London) to leave your phone on the table (at a certain angle) while having lunch. Today we pretend we don't have them on us. You don't need to be "smart" to be useful. Some years down the road one can almost imagine this becoming a successful product category – with the headset functionality being an add-on option when you choose your frames. In this scenario the key player is the packaging business in the middle: a licensing business, someone who can package the components to fashion brands. Think of the template Wear OS smartwatch packing Qualcomm chips and Google software that can be easily licensed to fashion brands. Fashionable watchmaker Fossil designs the watches sold under brands like Emporio Armani. They're not so different, just different enough.